Everyone wants to think using email to prospect is incredibly efficient and the only effective way to generate leads in today’s marketplace. Excuse me, but let me say it right now: Chances are your emails aren’t making the impact you think. Stop and ask yourself this question: “How does my prospecting email look on a smart phone?” This is one of the biggest mistakes salespeople make. They craft what they think is a great email on their laptop, but fail to realize that the recipient will most likely read it on a smart phone. Quantity does not equal quality! Just because you send out thousands of emails, don’t go thinking they’re quality emails. The tighter we know who we’re prospecting, the better we can craft the email. It’s time for us to start thinking in reverse when it comes to emailing prospects. Mass emailing does not equal quality. It’s merely more mass! When you fail to email with integrity, you’ll wind up with prospects who lack integrity. Let’s face it. You attract who you’re appealing to. When we allow ourselves to use less-than-desirable and stupid email practices, the only thing we’ll wind up with is prospects of the same low caliber. What works in one industry doesn’t always work in another. Far too many salespeople are quick to embrace prospecting strategies tech companies are using, thinking they’ll work in heavy manufacturing, etc. Success will only be achieved when the strategies used are the strategies that fit for the industry you’re trying to reach. Times change and so too must your strategies. It’s amazing how quickly an idea that worked so well in an email can become a busted play. When you’re doing what everyone else is doing, what makes you think you’ll be seen as different? Check out the full interview with Heather and be sure to grab my new book, High-Profit Prospecting. 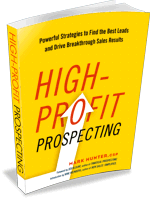 In the book I break down each element of prospecting, including email, and I show you examples on which you can build your plan.